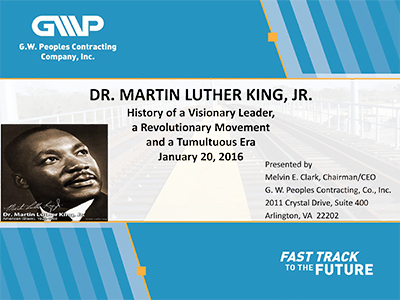 The 1st African-American Owned Railroad Construction Company In the U.S.
Valor and integrity are words that come to mind when you meet Melvin E. Clark, Jr. Esq., founding owner of the Metroplex Corporation. A gifted leader, Mr. Clark is currently the Chairman, Cheif Executive Officer, and owner of G.W. Peoples Contracting Company, Inc. a DBE/MBE/SBE certified contractor specializing in top quality construction, repair and maintenance of railroad tracks and related facilities, as well as construction and maintenance of railroad right-of-way and rail transit infrastructure. Amidst a career spanning over three decades, Clark has earned a reputation as an unflinching trailblazer and a staunch advocate for minority and disadvantaged businesses. He holds an undergraduate degree in accounting from Penn State University, a Juris Doctorate from Northwestern University School of Law and a Masters in Management from Northwestern University’s Kellor Graduate School of Management.